Nearly 300 million frisbees have been sold since their introduction 40 years ago, for both organized sports and recreational play. According to Mattel, 90% of Americans have played with this flying toy at one time or another, translating to 15 million people enjoying the sport every year. Now, older versions of this toy have become collectors' items worth hundreds of dollars or more. The frisbee's origins actually go back to a bakery called the Frisbie Pie Company of New Haven, Connecticut, established by William Russell Frisbie after the Civil War. The bakery stayed in operation until 1958, and during this period, the tossing of the company's pie tins, first by company drivers and later by Ivy League college students (some say it was cookie tin lids), led to frisbie becoming a well known term describing flying disc play in the Northeast. Several years after World War II, Walter Frederick Morrison—the son of the inventor of the automobile sealed-beam headlight—and his partner Warren Franscioni, investigated perfecting the pie tin into a commercial product. First, they welded a steel ring inside the rim to improve the plate's stability, but without success. Then, they switched to plastic and the frisbee as we know it today was born. The initial design, which incorporated six curved spoilers or vanes on the top, was vastly improved in 1951 and thus became the Pluto Platter, the first mass-produced flying disc. This design, which incorporates a slope on the outer third of the disc, has remained part of the basic design to this day. The Morrison Pluto Platter had the first true cupola (cabin in Morrison's terns) and resembled the concept of flying saucers (UFOs) depicted during this period complete with portholes. In 1954, Dartmouth University held the first frisbee tournament, involving a game called Guts. The founders of Wham-O, a California toy company, became interested in this flying disc in 1955 and about a year later began production after acquiring the rights from Morrison. The name was changed to frisbee after the company heard about the pie tin game on the east coast called Frisbie-ing. (Wham-O first marketed the Pluto Platter in January of 1957, but didn't add the word frisbee until July 1957.) In 1959, the first professional model frisbee was produced. It wasn't until the early 1960s when frisbees became the rage and soon organizations became established to promote sporting events, including the International Frisbee Association and the Olympic Frisbee Federation. The first game of Ultimate Frisbee, a sport of both distance and accuracy similar to football, was played in 1968 at a New Jersey high school. Now, it is played at nearly 600 colleges and in 32 countries. In 1969, the U.S. Army even invested $400,000 to see if flares placed on frisbees would stay aloft but without success. During the 1970s, several organizations were formed to promote specific events, including disc golf, freestyle, and Guts. The Professional Disc Golf Association (PDGA) now has over 14,000 members in 20 countries playing on over 700 frisbee golf courses. Today, 40,000 athletes in 35 countries compete in Ultimate Frisbee. The formation of such associations led to world championships being held during the 1980s. Today, organized competitions in nine different events (including disc golf and freestyle) take place each year around the world, under the auspices of the World Flying Disc Federation (WFDF). Established in 1984, WFDF has member associations in 22 countries and provisional members in an additional 28 countries. During Operation Desert Shield in 1991, frisbee was used to boost the morale of the 20,000 U.S. soldiers on duty in Saudi Arabia. Manufacturers of frisbees use computer aided design software to create a model. A prototype is then made to test the design. Sometimes, a wind tunnel and other sophisticated methods are used to test flying characteristics, depending on the type of frisbee. Manufacturing tolerances within a few thousandths of an inch are now incorporated into the design. Designers are always looking for new ways to manipulate the physical properties that dictate flight characteristics by changing the design or shape in order to improve lift, drag, spin, angular momentum, torque and other forces that affect how an object flies. For instance, adding a small lip and concave edge to a disc greatly increases its stability in flight. A major obstacle disk designers must overcome is this instability caused by gyroscopic precession, the tendency of spinning objects to roll right or left in flight, depending on the direction of their spin and where they get their aerodynamic lift. The closer the disk's center of gravity remains to its center of lift, the more stable and straight the flight. As a spinning disk flies, its center of lift is near the front, or leading edge, of the disc and tends to pitch the disc upward. Because of the spin, much of the lifting force on a point near the disc's edge does not exert itself until about a quarter of a revolution later. Such gyroscopic precession pushes the disc up on the side, causing a sideways roll. This is why frisbees, which typically are thrown backhand to spin clockwise as viewed from the top, tend to roll left from the thrower's perspective in flight. Once in the air, lift and angular momentum act on the frisbee, giving it a ballet-type performance. Lift is generated by the frisbee's shaped surfaces as it passes through the air. Maintaining a positive angle of attack, the air moving over the top of the frisbee flows faster than the air moving undemeath it. Under the Bemoulli Principle, there is then a lower air pressure on top of the frisbee than beneath it. The difference in pressure causes the frisbee to rise or lift. This is the same principle that allows planes to take off, fly, and land. Another significant factor acting upon the frisbee's lift is Newton's Third Law. It states that for every action there is an equal and opposite reaction. The frisbee forces air down (action) and the air forces the frisbee upward (reaction). The air is deflected downward by the frisbee's tilt, or angle of attack. Spinning the frisbee when it is thrown, or giving it angular momentum, provides it with stability. Angular momentum is a property of any spinning mass. Throwing a frisbee without any spin allows it to tumble to the ground. The momentum of the spin also gives it orientational stability, allowing the frisbee to receive a steady lift from the air as it passes through it. The faster the frisbee spins, the greater its stability. Frisbees have been made out of a thermoplastic material called polyethylene since the early 1950s. Polyethylene is the largest volume polymer consumed in the world. This material is derived from ethylene, a colorless, flammable gas. This gas is subjected to elevated temperatures and pressures in the presence of a catalyst, which converts the gas into a polymer. Other ingredients that may be added include colorants, lubricants, and chemicals to improve dimensional stability and crack resistance. Frisbees are produced in a high-speed process called injection molding, which is based on the injection of a fluid plastic material into a closed mold, usually of the multi-cavity type. Once in the mold, the plastic is cooled to a shape reflecting the cavity. cavity. Since complex shapes can be made using this process, minor trimming after removal from the mold is the only other finishing required. Because of these advantages, this process is used to manufacture a wide range of products, from various toys to automotive bumpers. A molding machine equipped with a hopper, heated extruder barrel, reciprocating screw, nozzle, and mold clamp is typically used. This machine heats the plastic until it is able to flow readily under pressure, pressurizes this melt to inject it into a closed mold, holds the mold closed both during injection and solidification of the material, and opens the mold to allow removal of the solid part. 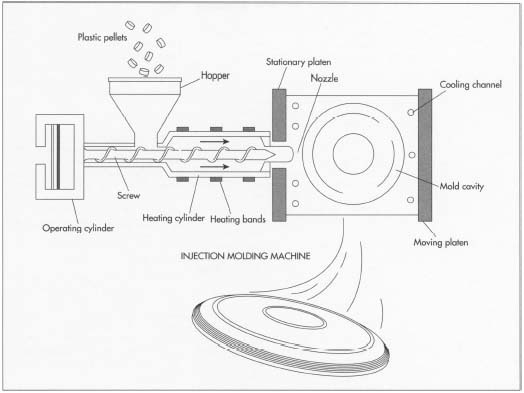 1 A separate compounding operation is used to convert the form of a resin, while also introducing any additives, into one suitable for injection molding. For thermoplastics, this usually means forming the material into dry, free-flowing pellets by a combination of extrusion and drying steps, that usually take place at the plastic manufacturer. Once the compounding step is completed, the material is checked for moisture content and average molecular weight. 2 The plastic pellets are then shipped to the frisbee manufacturer in 50-100 lb (22.7-45.4 kg) bags or in a 500-1,000 lb (227-454 kg) box. The plastic pellets are put into a large drum, to which pigments and weight-enhancing additives are added. A bonding agent such as oil is used to adhere the pigment to the pellets. The drum is vibrated to blend the materials together. 3 The unmelted pellets are placed into the hopper that feeds the material into the barrel. The hopper may be equipped with a drying system to remove extra moisture and a magnet, to remove any iron contaminants. Sometimes, all or some of the compounding operation takes place during this step. 4 During this step, the molding compound moves from the feed section into the heated extruder barrel that contains the reciprocal screw. Here, the material is gradually melted as it is conveyed down the barrel to the front. Tapered screws provide pumping, compression, decompression, and mixing, resulting in a pressure gradient that degasses the material with the help of vents in the screw. Thermoplastic materials require longer screws of compression ratios (open volume in the feed zone divided by the volume at the end of the screw) in the range of two to three or more. The proper compression ratio for an injection molding screw will be slightly greater than the bulk density of the as-received molding compound divided by the density of the melt. 5 At the end of the transport process, a volumetrically predetermined amount of compound accumulates somewhere in front of the screw as the screw slides out of the barrel. Called a shot, it is forced forward when the travel of the screw is reversed. To prevent the molding compound from flowing back down the screw during injection, a mechanical valve is placed at the tip of the screw. 6 Once there is enough material to fill the mold, the screw rotation stops and the machine is ready for injection. The melted plastic is injected into the mold through the nozzle, under high pressure (typically, 10,000-30,000 psi) using a system of runners leading to the gate of the mold. Usually more than one gate is used to deliver the material into the mold, with each gate being fed by a channel or runner. For proper injection, the air within the mold must also be adequately vented. 7 To speed up the solidification process, a cooling method is incorporated into the mold. This usually involves boring holes into the mold, through which a cooling fluid such as water can be circulated. After solidification, the mold clamp, which holds the halves of the mold closed against the injection pressure of the melt, opens the mold to allow retractable arms to remove the parts. During this step, the screw begins to rotate and melt new material for the next shot. 8 After the frisbee is removed from the mold, an imprint or decoration is applied with the name of the frisbee, manufacturer and other information or designs. There are three methods used, with hot stamping the most common. Other methods involve applying ink by using a silk screen or letter press machine. The letter press uses a different ink pad for each color. 9 After decorating, the frisbees are ready for packaging. One method involves placing each frisbee into a plastic bag to which a cardboard header is automatically attached with staples. Another method places the frisbee onto a cardboard backing, which is then shrink wrapped with a plastic film. Sometimes the frisbees are packaged in boxes. The weight is one of the most important properties and is automatically controlled during the injection molding process by the screw on the machine that pushes the proper amount of material into the mold. Another important property for golf frisbees is flexibility, which is tested by putting a weight on the edge of the disc and measuring the degree it bends. The PDGA only needs to test one sample of a new golf disc for flexibility. There is usually little waste produced during the manufacturing process. Sometimes after the frisbee is removed from the mold, it has excess material, called flash, around the edge. This is trimmed off, sent to a regrinding machine and then mixed with the virgin material. Other frisbees may be rejected if they are not the correct weight or have deco-rating defects. After the decoration is removed, by either cutting or by using a solvent depending on the application method, the rejects are also recycled in a similar way. The frisbee is expected to dominate the twenty-first century as one of the great sports and pastimes. Frisbee sports should continue to grow, as well as collector groups interested in preserving its history. Though other flying toys have come onto the market—such as boomerangs, cylinders, and rings—the flying disc will continue to provide more hours of entertainment to people around the globe than probably anything else ever invented. Disc golf specifically is experiencing record growth. In each of the last three years the number of courses in the United States alone has increased by 10%. Such growth should continue since there are still many areas of the country that are not yet aware of disc golf and the benefits it offers. Also, frisbee may some day be an Olympic sport. For a sport to be eligible for the Olympics, it must be played for two years in at least 50 countries. Ultimate Frisbee is already played in 35 countries and its popularity is growing, along with other frisbee sports. Horowitz, Judy and Billy Bloom. Frisbee, More Than Just A Game of Catch. Leisure Press, 1983. Johnson, Dr. Stancil, ed. Frisbee. A Practitioner's Manual and Definitive Treatise. New York: Workman Publishing Company, 1975. Malafronte, Victor. The Complete Book of Frisbee: The History of the Sport & the First Official Price Guide. American Trends Publishing Co., 1998. Tips, Charles. Frisbee by the Masters. Celestial Arts, 1977. Leary, Warren E., Lift. "Drag, Spin and Torque: Sending Toys Aloft." New York Times (June 20, 1995). Weismantel, Rick. "Part geometries, quality factors, and cycle times affect equipment choices." Modern Plastics (Mid-November 1994): D-74-D-79. Innova-Champion Discs, Inc. 11090 Tacoma Drive, Rancho Cucamonga, CA 91730. (909) 481-6266. http://www.innovadiscs.com/ . Professional Disc Golf Association. http://www.pdga.com/ . Wham-O Inc. 3830 Del Amo Blvd., Suite 101, Torrance, CA. (415) 357-4200. World Flying Disc Federation. Http://www.wfdf.org/ .